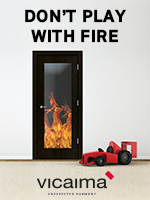 OrganoWood offers the next generation of environmentally friendly wood protection to fire and fungal attacks. Through its proprietary technology which mimics the natural fossilization process, the wood is modified by the attachment of protective silicon compounds to the wood fibers. The company supplies both ready-to-use OrganoWood®-modified wood and liquid products for own application. Wood free from both biocides and heavy metals which neither burn nor rot is now possible with OrganoWood®. The product provides the treated material an effective flame retardant classification and a high level of rot protection. Fire Tests (ISO – 5660) have been conducted by SP – Swedish Technical Research Institute and obtained excellent results. Rot protection test and mold tests have been performed by researchers at the Swedish University of Agricultural Sciences in Uppsala and currently an accreditated EN113-test is performed by SP – Swedish Technical Research Institute. The product provides The product provides good flame resistance and protection against rot and other fungus to the treated wooden material. OrganoWood 02. Protection can applied on fresh wood from spruce or pine which have not been previously treated but shall not be used on hardwood. The product is in particular useful in combination with OrganoWood®-modified wood in cuts or where other works have affected the wood. It can easily be applied using various techniques such as; (i) regular paint brush, (ii) rolling brushes, (iii) various spray techniques, including automated spray cabinets and (iv) by wood submersion. For detailed information about the product, please contact OrganoWood. OrganoWood 02. Repellent is to be used in surface applications of wooden materials. It is in particular used for wood surfaces that have to tolerate moist and humid conditions and for wood in outdoor environments. 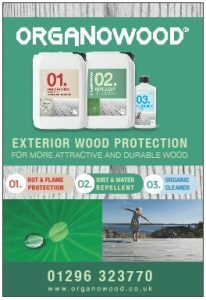 For more information on OrganoWood Wood Protection 01™, see the products Product data sheet or contact OrganoWood. OrganoWood 03 Cleaner is an environmentally labelled detergent made for cleaning of wooden floors outside. OrganoWood 03 Cleaner may be used both as general detergent for lightly grimed surfaces and as intense detergent for strongly grimed surfaces. It is a super concentrate. 0,5 Liter will cover about 250 m2. This entry was posted in Coatings, Sealants & Paints, Landscaping & External Works by Laura. Bookmark the permalink.